By now, we all know the Presto origin story: Three brilliant developers, Martin, Dain, and David, join Facebook in 2012 and start the Presto project shortly thereafter. From the beginning, Presto was designed to be a fast, interactive, SQL engine that can access data anywhere. 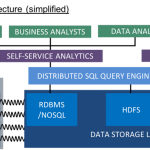 Initially, that meant deploying a faster alternative to Hive and being able to query data sitting in Facebook’s two largest data sources: MySQL and Hadoop. Six years later, Presto is faster than ever and now supports a long list of data sources. As the technology matured, so did the community around the project. Airbnb, Netflix, and Uber were early adopters of Presto and have made important contributions to the codebase from day one. Treasure Data (now part of ARM) was another early user and contributor to Presto. In early 2015, while working for Teradata, our team joined the fun and started contributing heavily. We added features like LDAP integration, Kerberos integration, spill to disk, Decimal data type, data encryption in transit (“secure internal communication”), and correlated subquery support. In 2017, our team left Teradata to start a new company focused entirely on Presto and thus Starburst was born. Since then, we have accelerated our pace of development even further, most notably contributing Presto’s cost based optimizer last year. As a byproduct of Presto’s increasing popularity, it became clear that the community had grown outside of the walls of Facebook and that it now needed it’s own institution, free from any corporate interests, to ensure that the project will remain independent, community-driven and focused on building high-quality software for the long-term. It is for those reasons that we are thrilled to join Martin, Dain, and David and support the new Presto Software Foundation (PSF). The PSF is a non-profit organization with a singular mission to support a community of passionate users and developers devoted to the advancement of the Presto distributed SQL query engine for big data.